According to the resume with which I secured Thrillist’s Travel Writer position, I am a well-traveled person who knows things. The degree to which that resume is embellished is a matter between myself and God, but I will hereby admit it wasn’t until earlier this year that I learned air traffic control audio archives are publicly available, pretty much in real time. 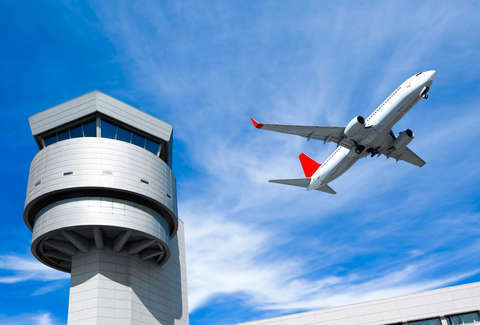 The best way to find these recordings is through LiveATC.net, a site where you can listen, as the URL suggests, to real-time air traffic control audio from around the world. You can do this on your computer (might need to download Flash first). Even simpler and easier, listen through the app, which you can download for iPhone or Android. It’s $3.99, which is at least $2.99 more than I had or had ever intended to pay for even the best travel apps. However, the magic of airports is that you can transcend such hesitations because airports are already lawless places where people line up for Domino’s pan pizzas at 7:30am before falling asleep on the floor. Earlier this month I landed from a red-eye in LaGuardia and, after producing $43.05 to replace headphones I’d left behind (yes, just the regular Apple headphones, no, I could not just wait) had to go straight to an unrelated flight at JFK (don’t ask) where I paid $9.79 for an egg-and-cheese at an establishment that didn’t even have any hot sauce. When you’re sitting on your next plane, wondering why it’s delayed and how many birthdays will pass before it stops being delayed, you will not mind spending $3.99 on this app. LiveATC has not bribed me to promote this by comping the $3.99; I called them up of my own accord because I think this is a cool thing and more people should know about it. Before we get started, I should warn you air traffic control audio is a little headache-y to listen to, in sort of the way Cloverfield is headache-y to watch. It’s a lot of mumbled feedback and static. Dave Pascoe, owner and founder of LiveATC, agrees that it takes most people some getting used to. The first thing you’ll probably want to do when looking up ATC audio for the exact airplane on which you are sitting is isolate the search by airport, for which you’ll need to look up the corresponding three- or four-character airport code. This is not the familiar-ish one that’s on your boarding pass, like LAX for Los Angeles -- that’s the IATA code (of the International Air Transport Association). Nor is it a common abbreviation, like DIA for Denver -- that’s... just a common abbreviation. Here you’re looking for the ICAO code (of the International Civil Aviation Organization, a specialized agency within the United Nations). For airports in the contiguous United States, this is often the IATA code preceded by the letter “K” -- KLAX for Los Angeles, KATL for Atlanta, and so forth, almost like west-of-the-Mississippi radio stations. You can look up your airport’s code here. You can try searching for your specific flight number first instead of going through the airport channels first, but this is harder for the layperson because the channel through which ATC is talking to your plane really depends on where that plane is physically around the airport at that moment. If you’re at the gate, chances are your pilot’s probably not talking to ATC yet, and won’t until you’re ready to push off. The app includes an airport diagram, so if you’re listening to a certain channel you can tap on the diagram to pull up the airport’s taxiways and runway layout, a feature Pascoe says users often miss. Once you’ve zeroed in on your airport, you’ll see a number of possible channels listed for that airport such as Approach, Arrival, Departure, Ground, or Tower. If you’re taxiing or waiting to line up on the runway, try looking for a Ground channel. So, if you’re in Atlanta it might say “KATL Ground.” I say “might” because some airports have more than one channel for Ground or Tower or what have you, so poke around the available frequencies. Yes, you’re supposed to have your phone in airplane mode if you’re about to take off, but if you’re not quite there yet or your flight attendant is sympathetic to your yearning for knowledge then you still have some time. You’ll also see a link called “Interesting Recordings” (on the left-hand side of the site, for those of you not ready to commit to the app) and this is truly the highlight reel of LiveATC’s archives. Comic relief? Yes. Disasters, accidents, what Pascoe refers to generally as “aircraft incidents”? Very yes. 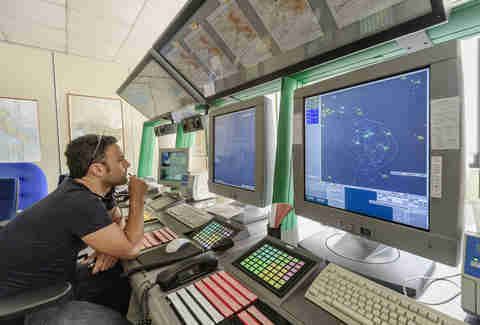 English-speakers are in luck, since English is the universal language of air traffic control. All pilots and air traffic controllers, no matter their country of residence or origin, are required to learn what’s called ICAO English and pass an English language proficiency test specially designed for aviation communications. A lot of the directives you’ll hear will be a standard phrase followed by a number. “Climb and maintain,” for instance, is an instruction to your pilot to climb to a given altitude and then stay there, so “climb and maintain 5,000” would mean they should commence climbing in altitude and then, once they’ve hit 5,000 feet, level off. “Turn right at 090” would mean the tower has assigned your pilot a new heading of 090 degrees, and they need to make sure they get there via a right turn and not a left turn. One of the phrases you’ll hear crop up most often is “cleared for takeoff,” which means exactly what anyone of sound mind would assume it means. Another common one is “line up and wait,” which means a tower controller is telling an aircraft to get onto the runway (line up) and then wait (that bit where you’re out there just sitting, a time which used to be dull but is now filled with Interesting Recordings). 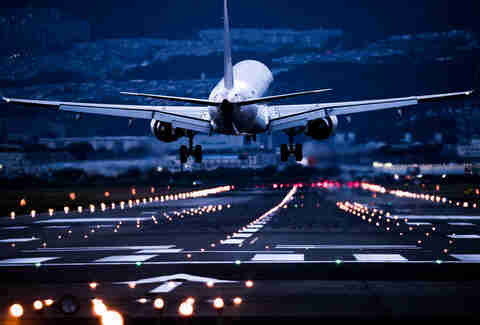 Then you’re cleared for takeoff. 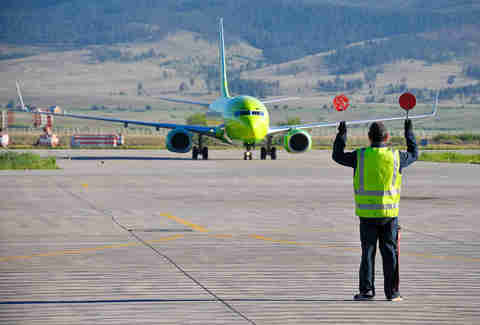 The reason you have to wait sometimes is because there might be crossing traffic on your runway, and you obviously want any other aircraft to be safely on the other side before you get started.